Scientific research into ocean and coastal acidification (OCA) and its effects on marine life is still a young and rapidly developing field. Early studies focused on effects of acidification on marine calcifiers, which are mollusks, crustaceans, reef-forming corals, and species of algae and phytoplankton that form skeletons or shells from calcium carbonate. The research generally revealed negative impacts on the process of biocalcification, and the findings raised con­cerns about living marine resources and the human communities that depend on them. More recently, researchers have been studying an ever­-increasing array of marine species from phytoplankton to fish, and they are investigating a range of biological effects beyond biocalcifica­tion. Despite these advances, there is still much to learn about the biological effects of OCA and how it will interact with other aspects of a changing ocean. For example, many species and early life stages that are most sensi­tive to OCA—such as shellfish larvae—live in coastal waters where complex biogeochemical processes lead to levels of coastal acidification that vary greatly geographically and over time, and where invasive species and warming waters are among the many other important factors affecting survival. In order to more accurately forecast how changing OCA conditions will affect the Northeast region’s ecosystems, it is necessary to move beyond limited­-focus stud­ies. NECAN proposes the following topics, in no particular order, as research priorities. Studies on commercially import­ant species to evaluate their sensi­tivity to OCA conditions, including American lobster (Homarus ameri­canus), blue crab (Callinectes sapidus), Jonah crab (Cancer borealis), rock crab (Cancer irroratus), horseshoe crab (Limulus polyphemus), sea scallop (Placopecten magellanicus), and many species of finfish, using populations from within the NECAN area. Multistressor studies considering increased pCO2 (decreased Ωarag) com­bined with one or more other stressors such as temperature, hypoxia, salin­ity, ultraviolet exposure, or trace metal exposure specific to this region. Multiple life-stage and/or multi-generational studies that follow one or more organisms through multiple life stages exposed to increased pCO2. Trophic interaction/indirect effect studies that consider how species’ interactions with other species or with their environments may change as a result of increased pCO2. Studies considering species responses to variable pCO2 con­ditions to better reflect conditions in nature. Process investigations to quantify the relative magnitude of the effects of each of the primary forcing agents (air­-sea exchange, upwelling, river/stream, estuary, benthic/pelagic biology, ver­tical mixing) on Ωarag dynamics and trends across the region. Climate-quality monitoring of the net changes in carbonate chemistry using a strategic design that permits quan­tifying net changes in the dominant forcing terms, including the boundary conditions (e.g., Scotian Shelf chemis­try, upwelling waters, rivers). Establish carbonate chemistry long-term trends across the region including hindcasting to the pre­-industrial period, forecasting impend­ing conditions at weekly to sea­sonal scales, and projecting long-­term changes in carbonate chemistry under IPCC scenarios. Field studies to help us move from single­-species effects to ecosystem effects and improve our understanding of how OCA affects organisms in their natural environments. 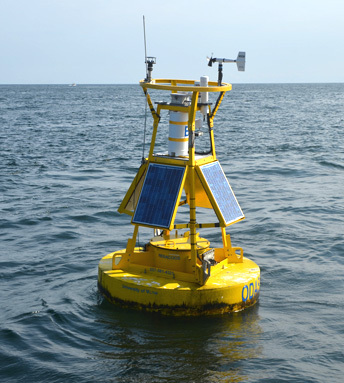 Considerable OCA research and mon­itoring capacity is available in the Northeast region, including laboratories, monitoring buoys and stations, and Ocean Survey Vessel (OSV) sampling locations and continuous underway monitoring, all of which provide biological and/or carbon­ate chemistry data relevant to OCA mod­eling and research. However, with the exception of a few fixed auton­omous stations, the sampling frequency throughout much of the region is too low to adequately capture short­-term epi­sodic events that could pose more acute, immediate concerns to impacted indus­tries and managers. As an example, the East Coast Ocean Acidification cruise (purple dashed line and dia­monds in figure) sampled the same areas as prior Gulf of Mexico and East Coast Carbon Cruises, but while it offers consid­erable spatial coverage, it is scheduled to be repeated only once every four years. Furthermore, even in cases where high­-frequency observations are being recorded, they typically measure only one carbon parameter such as pCO2 and do not permit real­-time determination of Ωar, which limits the utility of the data. The amount of monitoring is also uneven across the region. For exam­ple, wiehin a 12-mile radius of Portsmouth, New Hampshire, there are three stations that each monitor at a range of depths, whereas the closest station to the state of Rhode Island is at the Martha’s Vineyard Coastal Observatory—over 40 miles away and monitoring only near the seafloor. To date, most observing efforts have measured OCA conditions at the sea surface because of lower cost and greater technical feasibility than deeper measurements, even though many of the affected spe­cies live on the seafloor. The few short-­duration, time-­series studies that document subsurface conditions reveal important coupling between sur­face blooms and subsurface remineraliza­tion. Enhanced saturation states in the surface, which may be beneficial to some organisms, may yield corrosive conditions in the subsurface. This finding suggests that monitoring at full range of depths from the surface to the seafloor is important to understand OCA. A more comprehensive observ­ing system is needed to provide enhanced spatial and temporal coverage, and to monitor below the surface. This system will require leveraging existing capacity and expanding the system. NECAN is already working toward improving the research and monitoring net­work by bringing together project man­agers from government, academia, and industry to synthesize regional data that can aid in recommending regional prior­ities. While not intended as a data repos­itory, NECAN encourages its mem­bers to leverage existing observational networks—such as the Northeastern Regional Association of Coastal Ocean Observing Systems (NERACOOS)—to meet the emerging needs of researchers and stakeholders. To advance research, NECAN recommends expanded use of ships of opportunity, volunteer observing programs, and equipping already in-­place buoys with additional sensors.